If you don't want me to list your home, I can probably appraise it for $350. 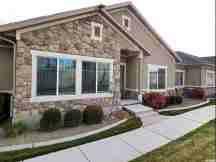 If you want me to list it, I can do an appraisal for free, but I must disclose my interest in listing the property, because I am a Utah State Certified appraiser. However, most of the time, a market analysis is adequate for sellers to determine a price at which to list their property. Give me a call and we will have an open discussion about doing what is best for you. I can do whatever we agree to, as long as everything is fully disclosed. I will never do anything that is misleading, and I will not appraise your property high or low. I choose to be honest and ethical in my work, and isn't that what you want?